God requires it of the prophet. He MUST speak out about what he sees going on. Shout it aloud, do not hold back. 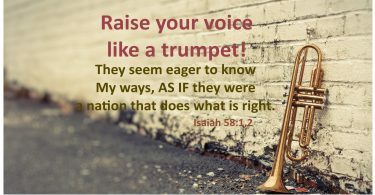 Raise your voice like a trumpet. Declare to my people their rebellion and to the descendants of Jacob their sins. For day after day they seek me out; they seem eager to know my ways, as if they were a nation that does what is right and has not forsaken the commands of its God. They ask me for just decisions and seem eager for God to come near them. they act like they are serious, God-fearing folk. But God is upset – not at all pleased with them. “They seem eager”…”as if they were a nation that does what is right”. Isaiah is commanded to speak loudly, publicly of their sins and their hypocrisy. They are corrupt, in serious danger. Sadly, people who are living in rebellion against God, but are still acting quite religious, do not want to hear about it! Find and work from your truest, deepest values… Say it out loud, and every chance you get. Lakoff is speaking of our personal, seriously derived convictions. Isaiah is speaking out of a sense of the LORD laying an explicit moral burden on him. Being Scripture-mentioners does not protect them from being targets of God’s irritation, anger, and threat of judgment. Again, like a lot of American Christians today. The effect on us is the same. This is the prophetic message, this is fundamental moral realism, and we must listen, embrace it, personally practice it, and seize – or create – opportunities to say it. ways it applies to today’s American right-wing Christians. This starts to get scary. These were the people who regarded themselves as God’s own, the people who prided themselves that they were God’s true followers, the people certain that they had correct teaching. Just like a lot of American Christians today! 2. The LORD is deeply offended at the behavior and values of these very religious people. Being religious does not protect them from being wrong. Being Scripture-mentioners does not protect them from being targets of God’s irritation, anger, and threat of judgment. Again, like a lot of American Christians today. 3. There are two areas of offense emphasized in Isaiah 58. American Christians today are very guilty on both counts. a. false worship, superficial worship, pro forma worship, nominal worship, words without heart Isaiah (the LORD) is not concerned here with whether their theories are orthodox. He is greatly offended that their religious activities are superficial, manipulative, not genuine. The issue is not doctrinal accuracy, but practical, daily genuineness. Practice, not theory. This is a recurring complaint in Isaiah (and all of the Bible), and all through history it is a perpetual problem in religious communities. God (and Isaiah) hold a high but very reasonable standard. If we see these things, and we don’t say them “out loud”, how will we explain that? And just who do we expect WILL actually say it? 8 Then your light will break forth like the dawn, and your healing will quickly appear; then your righteousness will go before you, and the glory of the Lord will be your rear guard. 9 Then you will call, and the Lord will answer; you will cry for help, and he will say: Here am I.
then your light will rise in the darkness, and your night will become like the noonday. 11 The Lord will guide you always; he will satisfy your needs in a sun-scorched land and will strengthen your frame. You will be like a well-watered garden, like a spring whose waters never fail. 12 Your people will rebuild the ancient ruins and will raise up the age-old foundations; you will be called Repairer of Broken Walls, Restorer of Streets with Dwellings. 14 then you will find your joy in the Lord, and I will cause you to ride in triumph on the heights of the land and to feast on the inheritance of your father Jacob.” For the mouth of the Lord has spoken.